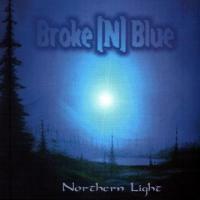 Swedish AOR melodic Rock band Broke[N]Blue has released their first full length album called "Northern Light". This album captures the essence of Scandinavian melodic hard rock - and with Lars Abrahamsson flair for writing a catchy tune and using his two lead singers, Eva Eggesjö-Abrahamsson with a voice very close to Heart's Ann Wilson and Peter Gustavsson who comes very close to Jimi Jamison - who could ask for more in the world of melodic rock? I have talked with main man, song writer, guitarist and keyboard player Lars Abrahamsson about the "Northern Light" album and the melodic rock scene in Scandinavia - read on and get the latest news on Broke[N]Blue and Lars' wish for working with Robert John Mutt Lange on the future albums. Q: How did Broke[N]Blue start? A: Hi Steen! Here comes the interview answers! A little late, due to a lot of ordinary work, and of course the shock after the horrible deeds in USA. It all took off when I published a new song on mp3.com in early spring 2000. I wanted to see if there was any interest at all for this kind of music nowadays. In 1999, I asked Peter Gustavsson if he could do the vocals on that new song, a power ballad Bryan Adams style, and the result was "Heaven in my hands". Almost immediately, some Webzines showed interest, and wanted to hear more. I also made a lot of e-mail postings to different contacts on the net. The interest grew, and I wrote some more songs, and made new versions of some older songs in the same style. My wife Eva appeared on some songs to put more width to the material. 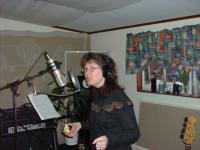 I was very pleased by the result of using the two voices, and kept on writing new material. A 7-track demo was made in our homestudio and sent around to a lot of magazines, webzines and labels. The interest was so strong that we now decided to make a full length album. 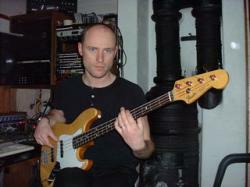 Ulf Vestlund joined on bass and drums and we began the recording sessions in his studio in nov 2000. Some labels were interested and we finally signed a distribution deal with Maple Leaf Records. Q: What is your source of inspiration? In my review I have mentioned the tougher side of fellow Swedes Roxette and of course Heart. But who do you (and your wife?) see as a major inspiration. A: Yes, of course Heart and Roxette are a great influence, but maybe more to the sound and performance of the songs. The songwriting influences are very wide, for example Bryan Adams, ToTo, Journey, Boston, Asia etc etc. My new songs are a result of all music I listened to in the 80’s and with a touch of the more modern music of today. Some of the songs were actually written in 88-90, so they are really pure 80’s AOR! Q: Where do you live in Sweden and how is the musical environment in your country today? A: We all live in middle Sweden, around a small village called Kolsva. It is not so far from Stockholm, 150 km. Here in Sweden AOR/Melodic-rock has been struggling to survive during the 90’s. The live scene is minimal, although some of the best bands and releases comes from Sweden. I think the times are changing and we will hear more of this music everyday soon. Many radiochannels are playing pure 80’s music, and Broke[N]Blue managed to get airplay now 3 weeks in a row on a commercial channel in Sweden, RIX FM. Q: On the album you are writing the songs, playing the guitar and keyboard and producing - how do you work all this in the right place. What is typical "Day at the office" for you? A: During the recording period, I had a pretty tough time! I was working with my ordinary job during daytime, and after work driving to the studio, putting down the base recordings with drums and bass together with Ulf.. All keyboard and midiwork was made earlier in my own homestudio. Then back to the house to Eva and my kids late at night, just to get up to work for the next day! Ulf is playing with Swedish top coverband De Sotos and he’s on tour a lot, so these days I was alone in the studio, doing guitar-work. When everything in that section was ready, Eva and Peter joined me in the studio for the vocal sessions, and finally we made the backing vocals together. I was involved in every part in some way, which was pretty frustrating at the end, but I guess that’s a part of the game. We really could concentrate on one part at a time, which is good for the final result. But if we’ll make another album., I wish I can take more time off, and do the CD in a shorter time. 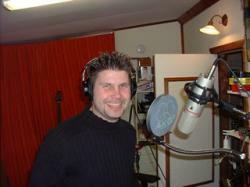 We started in Nov 2000 and made the last recordings in May 2001. Q: If you have been around in the late 1980's you have bee huge - how do you see the AOR/melodic rock/hard rock genre today? Because I have seen a positive development the last few years with the use of web-sites, discussion groups on the Internet and the possibitity to get a grip on the records by using on-line stores like CD Now - and you are using Hang Loose Records. A: As I mentioned earlier, I think there’s a wind of change blowing for this genre too. The internet is a superb media to spread information, for both new and wellknown artists to get exposure at a lot of places and reach millions of people at one time. And it’s free most of the time to use this promotion, which makes it even more fantastic! HangLoose was interested in a early stage, they contacted me to get the 7-track demo, and when we announced that we should release a full length CD, they shared the distribution with Maple Leaf Records. Q: How did the rest of the world reciewe your new album? A: We’ve had a lot of reviews around the globe, and most of them are published at my homepage on http://www.broke-n-blue.com They are all very positive and mention the fresh sound and the use of two vocalists as a great part of the album.Some wished that the production would have been better and done by for example Mutt Lange, and what can I say? Who wouldn’t wish that too? As a new act, the budget isn’t too big for the first album. Although we’re satisfied ourselves, and Ulf did a great job creating the sound for the album. Q: What are your plans for the future? Do you play live? Are you working on new material? Do you give a lot of interviews? Is the public interested in your CD? A: The main thing right now is to promote the cd and to get it exposed in countries outside Europe. Maple Leaf Records handle Germany, Austria and Switzerland, but they also sell the cd worldwide. There has been a lot of interest from Japan, and I know at least one shop/mailorder which stocks the cd. Vinny Records is working on the Spanish area, and I’ve also shipped to South Africa lately. In Sweden the big mailorder www.Ginza.se recently added "Northern Light" to their catalog. The live thing will of course have to wait, and I don’t think we make any efforts there, unless there’s a major breakthrough or something like that. 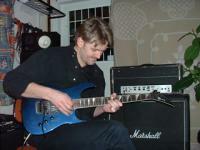 Ulf is playing live all the time with De Sotos and me and Peter are playing with his Party/coverband SIXPACK. Regarding new material, there’s a lot of songs and ideas to start with, but it’ll have to wait while we’re working on the promotion for "Northern Light". On the interview side, we’ve done some for ROCK IT! Magazine, Germany, and on the web for Heart of the rock, Rock Reunion Webzine etc. Coming soon is review/interview in Rock Report, and of course on this great site!! We also did a local television and radio interview recently. Q: If you had 3 wishes for your own carreer in the future - what would they be? A: Of course that our album will get really good sales figures, that the interest for this music in general will grow all the time so we could go on with Broke[N]Blue, and that we will make a second album, produced by Mutt Lange! Q: Well I will sure hope we would hear from you again - your record is quite amazing!! A: Get back to me if there's anything you'd like to add!